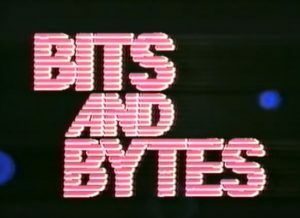 I grew up in the U.S. and never had the opportunity to see the wonderful Canadian instructional TV series called Bits and Bytes that taught people how to use a computer. This series consisted of 12 episodes that ran from 1983 to 1984 right in the peak of personal computing in the early 1980s. The series covered topics such as software, programming, modems, education, games, graphics, and music. Each episode features several different popular computers at the time including the Apple II, TRS-80, PET, TI, and of course the Atari 800. These are fun to watch but can be a bit tedious at times as they step the naive user through simple things like turning the computer on. I summarize below the episodes and times where the Atari 800 makes an appearance. All of the 12 episodes can be found on YouTube. This episode mostly features the Apple II but the Atari 800 is briefly introduced at 18:39. Some Atari education software is mentioned at 1:19. An Atari 800 with three 810 drives and an 822 thermal printer can be found at 15:55. The segment at 18:00 shows the host loading Conversational French on an Atari 800 using the 410 cassette recorder. They then introduce the idea of a cartridge with the Atari 800 at 24:36. Interestingly, they call it a “ROM pack”. This episode seems to exclusively focus on the PET. No mention of Atari. This episode features at Atari 800 and 810 disk drive at 18:58. They use it in this segment with Filemanager 800 from Synapse to illustrate saving data in a database. No Atari computers in this episode. They do have a cool scene though at 22:50 with three PETs talking to each other. The Atari 800 is briefly mentioned at 19:37 as one of the few computers that didn’t have BASIC built in. No Atari computer is shown here but they do show the My First Alphabet software for the Atari 800 at 11:40. The Lemonade stand simulation is featured on the Atari 800 at 9:47. The Scram nuclear power simulation is featured at 11:15. A nice interview with Chris Crawford from Atari talking about Eastern Front and Scram is at 16:30. No Atari in this one! Player Piano on the Atari 800 is featured right off the bat at 0:50. This episode focuses mostly on the IBM PC. No Atari. Episode 12 – What Next? No Atari in this episode. These episode are a lot of fun to watch. I was happy to see that the Atari 800 was featured in many of the episodes. I definitely recommend watching as many of these as you can. There was another series in 1991 but I didn’t watch those.